This is a ludicrous cake, but very fun, and if you find yourself invited to a children's party, or indeed, are contemplating a 'retro' (read, kids food + booze) shindig yourself, then here's your beast. What's more, it's super easy, so you could always impersonate a five year old's baking abilities by getting drunk and eating sweets. Grease a 20cm round baking tin. (I used a silicon one, but a traditional metal tin should be greased and lined). Place the ice cream in a large bowl with the milk, and stir to loosen it up. Sift in one third of the flour, and the baking powder. Fold in with a metal spoon, stirring a little to combine then repeat with the rest of the flour. The dough will be quite stiff, but don't overwork it, adding a little more milk if necessary. Splodge into the tin, smooth over the top with a clean spatula. Bake for 40-45 minutes, until risen and a skewer comes out clean. Cool in the tin for a few minutes before turning out onto a wire rack and leaving to cool completely. Make your jelly according to the instructions on the packet, and pour into a second 20cm sized mould. Place in the fridge to set. Carefully cut the cooled cake in half and brush each half - top and bottom - with some of the apricot jam. Turn out the set jelly onto a plate and sandwich between the layers of ice cream cake. Then, using a sharp knife, cut a hole in the middle, through the cake and jelly, until your cake resembles a ring (Warning: THIS CAKE WOBBLES. Absurdly). Dust a clean surface with icing sugar. 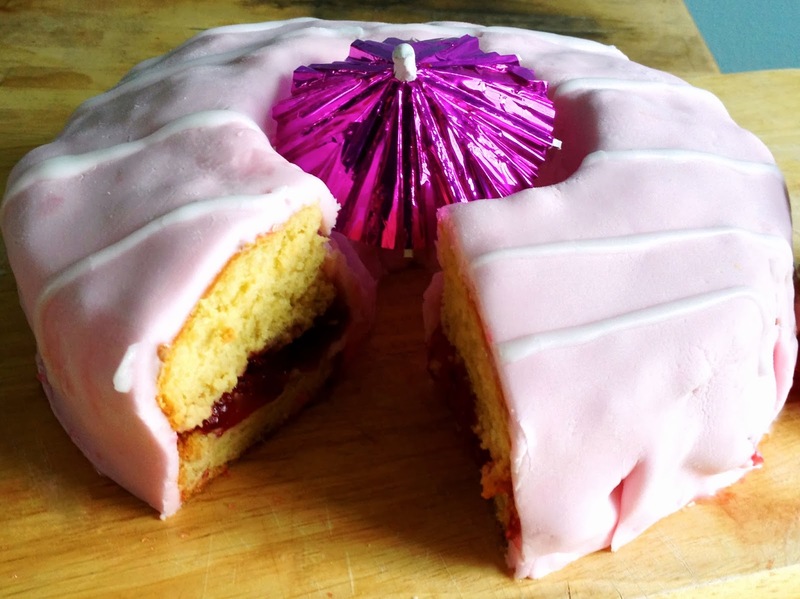 Knead the fondant icing until smooth, adding the pink food colouring as you go, then roll out into a large square. Drape over the cake, pushing down into the hole, smoothing over and trimming the edges as necessary. Make up the water icing by placing 100g icing sugar in a bowl. Mix with a few drops of lemon juice and add the water a little at a time until it reaches the desired consistency. Drizzle or pipe the icing over in lines and stand back, plotting how to win the next game of musical statues.